Here is a quick training session I provided for staff on effective revision strategies. 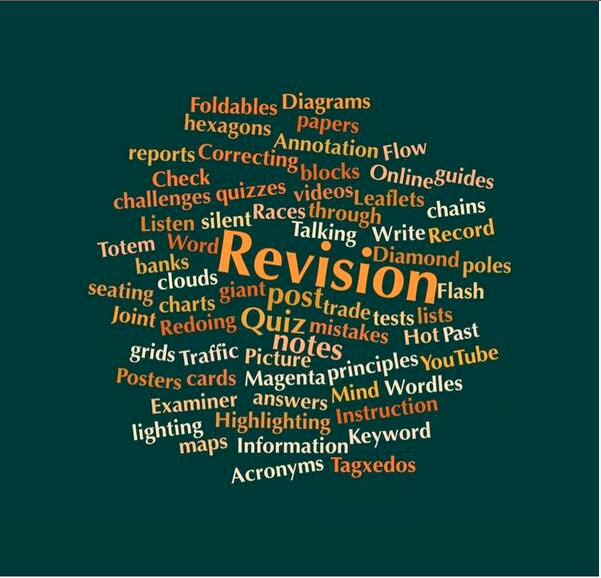 I have continued to collate really useful blogs about revision… scroll down to read them! These were my initial thoughts, I have added where I have developed my thinking in red! I am no expert! I am not simply basing these ideas of MINE on research/theories (that I have read) and on the students that I have taught and the outcomes they have achieved. If you disagree, please do comment with how I can better my practice for the students I am responsible for. Time to wrap up our delivery of content, vital information, key facts, formulae, dates, people and so on. It is now time to focus (again/more) on ensuring students know everything and anything they will need in order to secure an excellent grade/number in the exam. A-C or 9-5 grades are not the only grade our students need to achieve to be successful. Ensure your students know what their personal targets are and what success looks like for them. 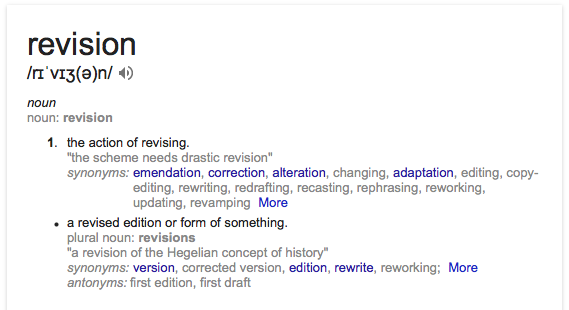 By definition revision is about updating, revamping, reworking, redrafting, rewriting and so on… It is important to note revision is not new LEARNING from scratch. Therefore, the following information and ideas I will be presenting will work best, when learning has already taken place. When there has been repeated, retrieval and regular retention of knowledge taught/learnt. Picking the right time of day to revise is vital. Knowing when one feels most active and alert is crucial in ensuring the brain functions the best. I liken myself to an OWL or a vampire! I love staying up late to study/write/prepare. I would much rather a lay in then getting up early to revise. `Ensure your students know what time of day they are most active?’ Let them build on this, if they get up later, they would get to bed later, so in theory they will have the same amount of time in a day. However, do not work too late into the evening, research shows that working later makes our revision less effective. Knowing how much time to spend on revision is also vital! We must be realistic, students do have OTHER things to do. We need to accept that. Therefore, creating a reasonable, valid, achievable timetable is essential. This might sound easy to us; i.e telling students to write a timetable, however, I have always found it time well spent getting students to do this in class with a template provided. Do you do this? I always ask my students to write down their essential ‘other‘ tasks in a day, then their non-essentials. Next to these, I ask them to add up how long they spend on these. I ask them to then tally up the amount of time they spend on essential and non-essential tasks in total. This is usually enough of an eye opener for students! The brain is like a muscle, we can not expect our students to revise all day and night. When we workout, our muscles need a rest. However, I do not feel we should be prescriptive with the amount of time we tell our students to revise for and when to take a rest. I personally feel we all have different thresholds and it should be down to the student to decide. 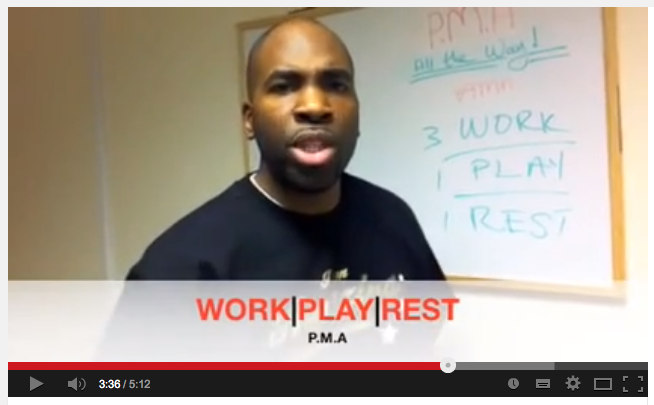 The message however is clear, take regular breaks to refresh and rest your mind. work, work, work, play, rest. See the video here for more info! Students must be able to work in an adequate environment. Sometimes, some students homes can not provide this. Research for your students their local library opening times, the facilities they have there. What bus stop is nearest? Find out other places students can study? Motivation to be successful isn’t for a revision post… See my last post regarding this! In order for information to remain in our long-term memory, we must understand it (we must have to had thought about it), we must then link it to already acquired knowledge and then attach meaning to it. Ultimately, we want to then apply it to examination questions. Therefore all revision sessions/games/lessons should take on board those concepts. understanding– do the students know exactly what this concept/idea/topic means? Can they explain it to others? Linking to knowledge- can the students link the information to other ideas, areas, concepts? Think hexagons? meaning– do the students know the reasoning behind the learning? Have they contextualised it? 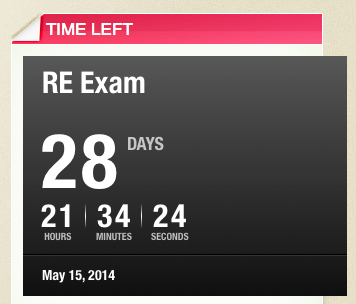 applying– will the students be able to applying their knowledge and meaning to the exam? Often, I worry that revision games become exactly that. A game. The focus on understanding, or linking is lost through the ‘fun’ nature of the game and the objective of winning becomes more important than the learning that should be taking place. Here are some revision station games/ideas I use. Click HERE. I have listed under each activity what the focus is. I have however, also come to realise some students do not like doing a variety of tasks as they know themselves, what works well for them. I Only believe this feeling/confidence from the students if they have proven this. Meaning, have they achieved good grades previously? Therefore does their style of revision work? Ask them to talk through it with you; how did they revise, what did they do, how did they ensure they achieved a good grade? If they answer well, then allow them the independence to choose their method of revision. This will motivate them too. Revision to me is also ensuring that students know about a variety of ways they can revise. I often go on and on and on about the importance of taking information and linking it to your knowledge, transforming the information to help understand it and applying it to examination questions. Reading and highlighting notes is the pre-cursor to revision, those are the tasks that are carried out in lessons or completed at home. All students revision notes should already be annotated/highlighted BEFORE revision begins? Have they created a contents page? Those elements are learning/preparation. Therefore, hand out revision guides well in advance, give your personally created booklet of advice before the holidays, before the course may have even finished. 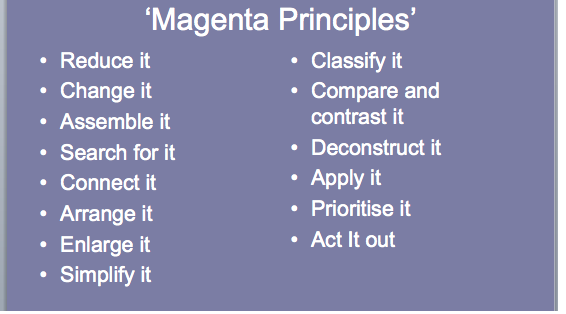 A great way of ensuring students do not become too complacent, thinking they understand information because they have simply over familiarised themselves with it by reading it constantly, is to apply the magenta principles to text/information. See my most recent post about this! Use the hashtag #RevisionIdeas17 to search out great posts by other teachers. Show students there is a multitude of ways to revise, but make sure they are sticking to the core principles. 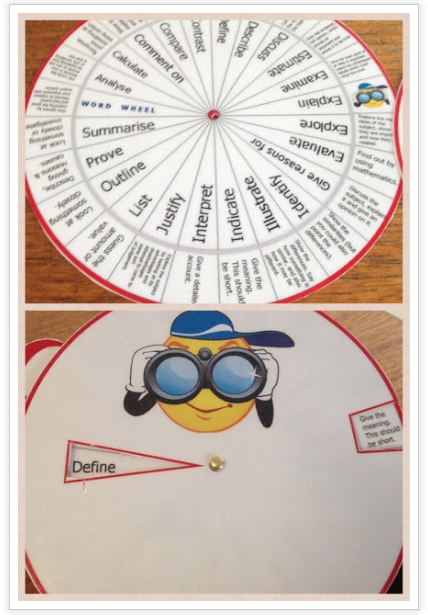 Download and share this literacy/command word wheel. This helps break down for students exactly what each question is asking the student to do. Understanding the subtle differences is paramount. Revision should be on ongoing process checking for understanding throughout the course, (marking and feedback,) Know your students understand the meaning and are able to apply concepts in exams. I have always shown exam past papers and mark schemes to students from the very first week of my lessons. I have ensured students are familiar with the layout, the way the questions appear, the style of the questions. I have ensured students read examiner reports, know where to download past papers. Check out my GCSE RE blog- www.cheneyre.edublogs.org where I have shared this info. Content Dependent Learning- try this really useful idea by Sir Tim Brighouse. Click here. Includes a 2 minute video presentation explaining this concept. Create podcasts/videos/information throughout the course. Click here and here for some ideas. 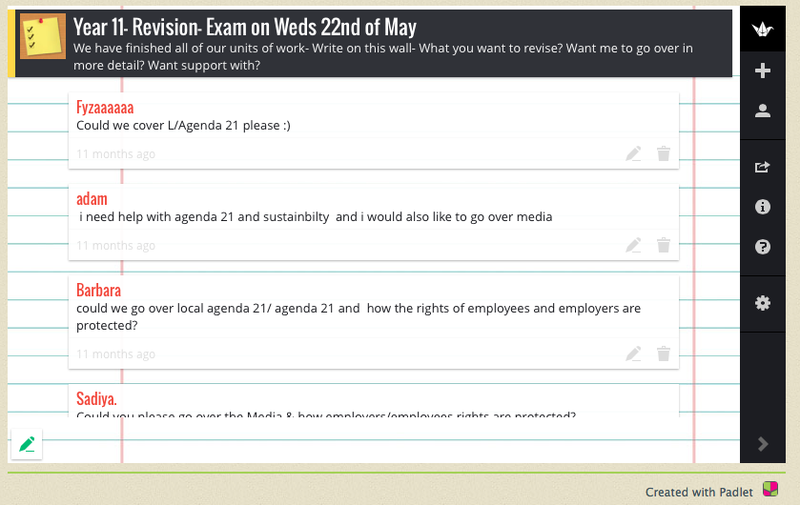 Running revision sessions is excellent; however ask the students BEFORE hand what they want to revise, add a Padlet to an email? To your class blog? Ask students to fill in a piece of paper…however you do it, ask students to tell you what they need most help UNDERSTANDING, knowing the MEANING of and how to APPLY. Involve students in the revision process as much as possible. Get them to create the revision guides for the year below, ask them to run the sessions. See here for a student based lesson. Get the students to create google drive revision questionnaires on a topic each. Get the students to then complete each others quizzes. Click here for an example. Ask students to tweet (run a subject twitter account for themselves. The teacher doesn’t need to get involved.) Get students to create a Facebook group? Teacher could set up an Edmodo page. Students should email (maybe more like FaceTime/Skype/snapchat/bbm) each other to remind each other to revise. incentivize the motivation! Practice…practice…practice… in the real conditions in the real environment. Give students past papers, photocopied and stapled as they would in the real exam. Get students to write in the examination booklets. Get them used to it. Familiar with the obstacle. Annotate the examination paper with useful/key information! Collective approach to revision; Ask subject leaders to coordinate their approaches. Check teachers are giving the same/similar message? 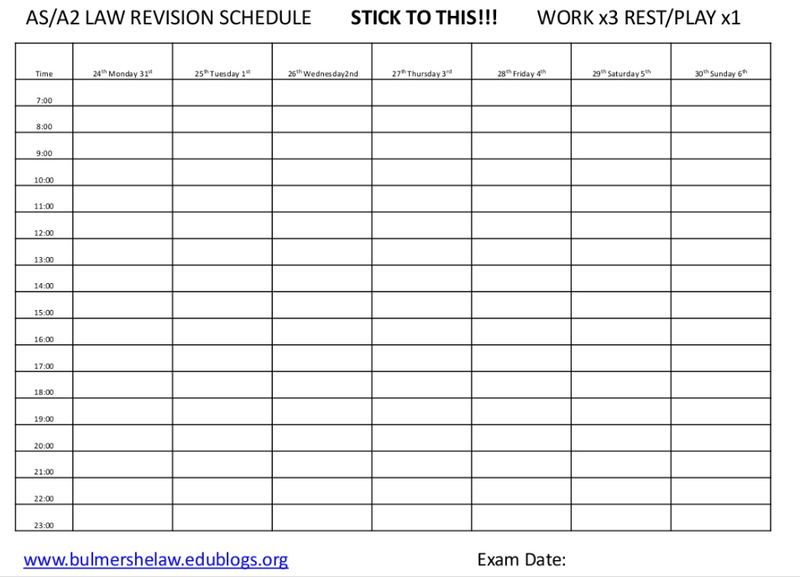 Check what the revision catch up schedules are on from other subjects. Ensure they do not clash. Here at my school we have a designated day for Eng, Maths, Science. To help alleviate the problem of students having to chose which subject they will miss. Link examination grades with outcomes. Why would it benefit the student to do well in your exam. Why is it important? What is the end goal? Use Youtube/Websites/APPs- videos (We have a revision channel on our school Youtube channel) and online quizzes (Such as Getrevising.co.uk or tutor2u.com) can be an essential ‘extra’ to revision. Don’t forget the core websites- such as Mymaths.com SamLearning BBC Bitesize and so on. Posts such as these can really help focus students on examination questions; Revision Mats, Concentric Squares/ Rotation Squares/ Overlays. Check out bit.ly/agilitytoolkit for many more. I do not have all the answers… I imagine this post will be constantly edited/updated when I remember more ideas! Lots of good stuff here, Amjad – thanks for collating your thoughts/ideas/tips. Also read this last week and thought it was interesting – did you see it? Extra Classes and MY extra time...? Who are learning walks for? Ten Principles of Instruction- Rosenshine, B. (2012) Explained from a classroom. Goodbye... How do you say it? But what exactly is Ramadan? Please sign up to Amjad’s Teaching and Learning Newsletter!